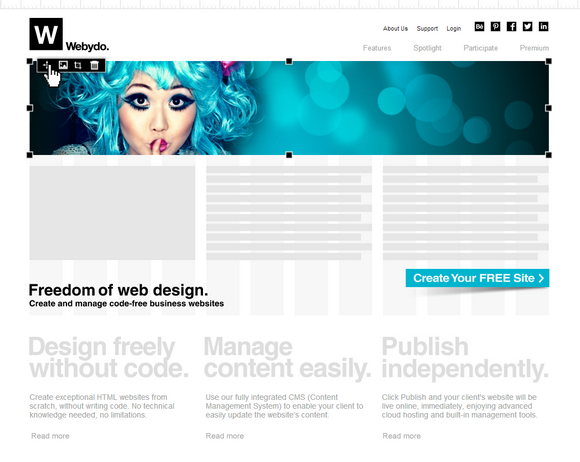 Webydo is a professional web suite that enables graphic designers to create and manage exceptional HTML websites, without writing code. Designers can bring any website design to life and with a click of a button, publish an advanced HTML website online easily. You will have full control over all design components such as: elements’ location, fonts and typography, backgrounds, image optimization, guidelines, etc. The drag and drop control enables you to easily upload elements such as: images, videos, forms, links, etc. All of the code will be converted into a W3C valid code automatically. And also, all sites on Webydo are hosted on advanced cloud hosting infrastructure that’s monitored 24/7, and your website will be live and secured even during the biggest traffic storms. One of the best things is the automatic backups, which is there to ensure your website’s data will always be available. Webydo partnered with Akamai to deliver your website through a Content Delivery Network (CDN) which is a large network of servers placed across the world as well. I found Webydo very easy to use and intuitive. You can quickly create exceptional HTML websites from scratch, without writing code. And best of all, it’s free or charge. Why not give it a try? Learn-able blog you granted here appreciated a lot to visit here and that’s most stunning that online web application. Thanks for your creative idea generating. Webydo’s online software is really professional, looks like something Adobe should have though of… Thanks for the recommendation! Thanks for your comments @Janifar22:disqus and @jamesdilbert:disqus! We really appreciate you taking the time to try Webydo to create your professional web design.